ANOTHER PROTEIN SOURCE WITH MANY BENEFITS! ProteinCo Canada’s 100% Micellar Casein protein powder has a variety of benefits for supporting your health, fitness and weight management goals. Depending on your particular situation, it’s great alone and then highly adaptable to meeting higher calorie demands. Casein protein adds a slow digesting protein to your varied protein intake throughout the day. Gain Weight – More muscle development and more body mass For those looking to develop more body mass and size, casein powder is a must have supplement. Getting good sleep is critical in this regard. Because casein is slow digesting, releasing amino acids for hours, it will help you build more muscle by keeping you satisfied during the night. Depending on your caloric needs, you may do well with mixing ProteinCo Canada 100% Micellar Casein protein into a bedtime smoothie packed with more calories, protein and L-Glutamine. This can be HUGE for helping your body manufacture maximum amounts of muscle building HGH as you sleep. Fitness – Boosting your immune system Casein has properties that have been shown to boost your immune system. Training puts stress on your body that is detrimental to your immune system at times. Anything you can do to boost your immune system will keep you healthy allowing you to remain active and fit. Additionally, only a small percentage of the population is allergic to casein, so it’s a safe choice for nearly everyone. Lose Fat – Helping you feel full longer so you don’t eat as much You are more likely to feel full and not over eat when you have something substantial in your stomach. When ingested, casein turns into a gel like substance in your stomach and it gets digested more slowly. The advantage is you will feel full longer and be more likely to reduce calorie intake throughout the day. Casein also has a molecular structure quite similar to that of gluten, which could reduce your cravings for starchy foods, contributing even further to body fat loss. Therefore, ProteinCo.ca 100% Micellar Casein protein powder can be effective as a weight loss supplement. ProteinCo Canada sells Casein Protein that is a slow acting milk protein ideal for long periods between meals and right before bed. By supplying amino acid release over a prolonged period of time, it keeps your body in the desirable muscle building state. This contributes to better muscle development over time. Our Casein is a lactose and fat free so it’s an ideal protein to consume when you want fewer calories or looking to lose body fat. It turns into a thick gel in your stomach so it will make you feel full longer, assisting with keeping your overall calorie consumption down. SLOW ACTING MILK PROTEIN FOR SUSTAINED ENERGY PRODUCTION! Casein is a different protein than whey The slow digesting nature of ProteinCo Canada Casein powder makes it an excellent source of additional protein during the day. Whey protein is a faster absorbing protein so it’s a better choice for boosting energy levels before training. We suggest you use both to benefit from their unique properties and to keep variety in your protein intake. BUILD MUSCLE WHILE YOU SLEEP! Casein is slow to empty from your stomach which makes it very efficient in supplying nutrients and time released amino acids. The amino acid release can last for several hours keeping your nitrogen balance positive, which is ideal for building muscles. Because of the slow digesting properties, casein is commonly used between meals and before bed by bodybuilders to maintain a positive nitrogen balance where muscle is built more effectively. Micellar Casein - Processed to separate the protein from the fats and sugars in milk, results in a pure protein in the form of casein. Typically you will get 80% protein from casein and 20% from whey. The bottom line is you get pure protein free of lactose and carbohydrates. Calcium - It’s commonly believed that milk is high in calcium so that’s one reason to consume it. While it’s true milk and our Casein Protein has a good amount of calcium, it’s not easily absorbed so you shouldn’t count on it as your calcium source. Due to the acidic nature of animal proteins, we recommend using our Sports Multivitamin to get highly absorbable calcium for those ingesting high amounts of daily protein in particular. Calcium is the most readily available source for your body to strive for alkalinity, so you want to make certain you get more calcium than what your food contains each day. TASTE - We formulated our 100% Micellar Casein protein with flavor and stevia to make it a tasty treat any time of day. Mixed with juice, milk and fruit, you can mix yourself a nutritious shake, high in protein and muscle building capability. Q – Can I consume casein if I’m allergic to milk? A – The primary allergen that causes milk allergies is lactose. This is the milk sugar that is extracted when our casein powder is processed into protein powder. This makes ProteinCo Canada Casien Protein lactose free which makes it allergen free for nearly all consumers. Q – What is the best time to consume casein? A – Anytime you anticipate long periods between meals, casein is an excellent choice. When you are sleeping is typically the longest period of the day where you ingest no calories. Therefore, consuming casein just before bed is an ideal time. CASEIN IS LIKE AN AMINO ACID TIME RELEASE MACHINE! Q – How can consuming calories help me lose body fat? A – For one, casein if free of fat, sugar and carbohydrates so it’s a low calorie, high protein food. This contributes to muscle development and typically increased metabolism. As well, casein digests slowly so it stays in your stomach and makes you feel satisfied for long periods of time. This contributes to reduced daily caloric intake which will result in more body fat loss. Q – Is casein rich in calcium like milk? A – Yes, our Casein Protein is fairly rich in calcium like milk. However, this form of calcium isn’t easily absorbed so it’s not recommended as your primary calcium source. Active consumers, particularly those who consume a lot of animal protein, need highly absorbable calcium supplements Canada to prevent calcium loss from your bones. Our Sports Multivitamin was specifically formulated for active lifestyles with plenty of calcium that is absorbable and synergistic with other nutrients. Certain nutrients are included or omitted in our Casein Protein for specific reasons backed by scientific research and development. Leucine is a key amino acid for helping you build muscle tissue. In addition, it is the only nutrient that facilitates the burning of deep fat stores in the body. Methionine is necessary for helping turn the protein you eat into muscle mass. Phenylalanine is another mood and brain function enhancing nutrient. This is one of the amino acids that should never be used alone in supplement form as too much can be detrimental to brain cells. Arginine helps open blood vessels facilitating the transport of oxygen and nutrients to working muscles. Proline plays a fairly covert role in protein synthesis. ProteinCo.ca is committed to bringing you Value, Quality and Results backed by our 40 Day Money Back Guarantee! Incredible Value - Buy direct from the factory and qualify for FREE Shipping in Canada! 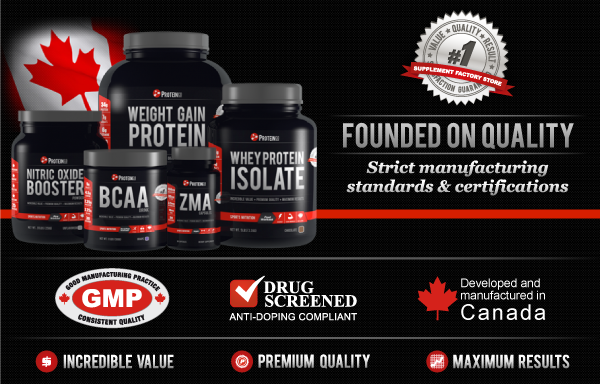 ProteinCo Canada’s commitment to you is in providing the highest quality product at the best possible price. One of the primary ways we accomplish this is by bringing the product directly to you rather than using retail outlets where the middleman drives up the price. Every order over $99 qualifies for FREE shipping which adds even more value. Premium Quality - Strict manufacturing standards and certifications As with all ProteinCo Canada supplements, our 100% Micellar Casein protein is manufactured under strict cGMP procedures to ensure the quality you deserve. You get the highest quality casein free of impurities. This translates to peace of mind for you no matter what your reason is for wanting pure, healthy supplements. Maximum Results – Fast, complete recovery adaptable to your needs We have formulated Casein Protein to be as effective as possible for the needs of everyone. You'll see improved results in a very short amount of time we are convinced. As with many of our products, Amino Recovery also lends itself well to personalizing for your specific needs. If you find adding protein, or more amino acids and carbohydrates better suit you, then by all means add one or more of our other products to make this drink uniquely yours. ProteinCo Canada Whey Protein Isolate, Whey Protein Blend, BCAA Powder, or Waxy Maize can be some great additions. Personalizing Add our Glutamine, Whey Protein Isolate, Whey Protein Blend, BCAA Powdered Drink, Waxy Maize or any other powdered product of ours as desired to meet specific caloric intake needs and training goals. NIGHT Nutrition The best time to consume ProteinCo Canada Micellar Casein protein powder is late in the evening or just before bed. The slow release of amino acids coupled with deeper, less interrupted sleep will have profound effects on your recovery and muscle development. It can be used effectively when you anticipate long periods between meals at other times of the day as well. Try it sometime when you don’t think you will be able to eat for many hours.